#WhirlpoolWashsquad - Wow,Woah & Whoopee!! Que que?? A free app that'll have my family working as a team? Right now Babushka y Sweetie are still doing the newlywed dance between houses. We haven't begun to decorate my place ( 1/2 owned with my brother, which is a story within itself) because the AC is broken and we're staying at his home. Sweetie's not my hermano's. Continuing. We were doing the washing of clothes at Sweetie's because his washer worked, but not his dryer- mine did, but not the washer. Now, neither washer nor dryer works at my place. What can BB say? They both came with the house. The washer and dryer, not Sweetie. The perils of homeownership and cheap appliances. So right now Babushka's team plan for laundry is us doing the clothes washing and BB running to the laundromat to dry. The clothes, not BB. Matter of fact, I leave there pretty drenched. Continuing. I know what you're thinking- why haven't they bought a dryer yet? Quee?? Remember I just came back from Miami and there hasn't been time to really shop for the set; so for now that'll have to do. Let's just say we're all grateful Babushka doesn't have to leave the house for work. 'Nuff said. Continuing. 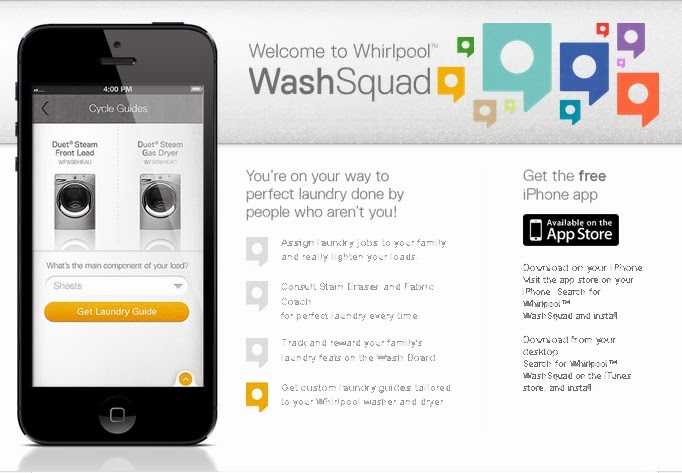 Here's some of the info I received on Whirlpool's WashSquad app. And the WashSquad features a Stain Eraser guide and Fabric Coach to help get you through even the toughest of loads without breaking a sweat. Download the free application now and you’ll be on your way to perfectly clean laundry that you didn’t have to do. Now that’s one kind of laundry we can get behind. (LINK TO DOWNLOAD: http://bit.ly/GPZeAg) "
Very nice verdad? You know what's also very nice? In December the temps here Up North in The South will be cool, no AC needed, so instead of repairing the AC, maybe we can get a quality Whirlpool washer/dryer set. AND since My Little One is moving back home with us at that time I'll be able to use the app too. A twofer!! Y tu sabes, y'all know Babushka loves those. "Presented by Mami Innovative Media, this is a sponsored post on behalf of Whirlpool.